Essex all-rounder Graham Napier has signed a contract extension, which ties him to the county until the end of the 2011 season. The 29-year-old is currently in South Africa preparing for the Indian Premier League, which starts later this month. 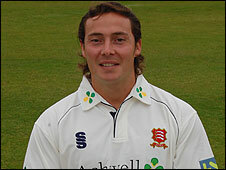 Napier told the county's website: "I am delighted to be with Essex until the end of the 2011 season, it is a great honour for me to play for Essex. "This new contract will bring my time at Essex to nearly 14 years."